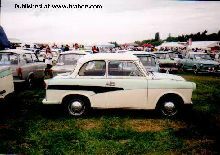 The Trabant is an automobile that was produced by former East German auto maker VEB Sachsenring Automobilwerke Zwickau in Zwickau, Sachsen. It was the most common vehicle in East Germany, and was also exported to countries both inside and outside the communist bloc. The main selling point was that it had room for four adults and luggage in a compact, light and durable shell. 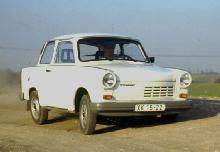 Despite its mediocre performance and smoky two-stroke engine, the car is regarded with derisive affection as a symbol of the failed former East Germany and of the fall of communism (in former West Germany, as many East Germans streamed into West Berlin and West Germany in their Trabants after the opening of the Berlin Wall in 1989). For advocates of capitalism it is often cited as an example of the disadvantages of centralized planning as even refueling the car required lifting the hood, filling the tank with gasoline (only 24 litres), then adding two-stroke oil and shaking it back and forth to mix. It was in production without any significant changes for nearly 30 years with 3,096,099 Trabants produced in total. The name was inspired by Soviet Sputnik. 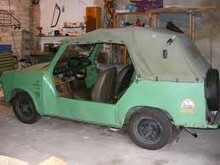 The cars are often referred to as the Trabbi or Trabi, pronounced with a short a. 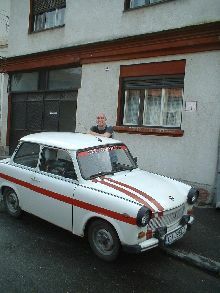 Since it could take years (usual waiting time 15 years) for a Trabant to be delivered from the time it was ordered, people who finally got one were very careful with it and usually became skillful in maintaining and repairing it. The lifespan of an average Trabant was 28 years. Used Trabants would often fetch a higher price than new ones, as the former were available immediately, while the latter had the aforementioned waiting period of mostly at least ten years.